Have you ever visited the seaside on a blustery, rain-swept day? Did you see seagulls hunkered down on the beach, their heads tucked into their bodies as they stoically weather the storm? As I looked at my fellow audience members that’s what I thought of as Haswell/Hecker brought their noise-storm down upon us. A few people made for the exit, many put their fingers in their ears and the rest, myself included, stood and endured. We were surrounded, you see: speaker stacks on each side of the Conway Hall. A strobe light and a green laser strafed the black-clad, elaborately pierced crowd and reflected off two strategically placed mirror balls (whose presence seemed just a touch ironic). Haswell/Hecker made full use of the three-dimensional space as they threw grating sound-forms round the room and batted avalanches of scree to and fro. I’d brought wax earplugs with me as a joke, but I was afraid for my hearing as the variegated higher pitches drilled into my skull like demented banshees intent upon wreaking maximum havoc. Sudden silences opened yawning chasms only to be pierced almost immediately by renewed onslaught upon our synapses. It was an exhilarating, physical experience that mixed pain with pleasure and conjured the sense of other, alien worlds. Pan Sonic are alternately masters of sinister chill and noisome jackhammer assault. On stage they adjusted their analogue hardware (not a laptop in sight) with due concentration while the screen behind them displayed a white on black waveform extrapolation of their sound. There was none of the subdued minimalism that makes up much of releases such as A and Aaltopiiri, instead the music consisted of marshal beats disrupted by squalls of noise which surged and maimed as they shuddered across the audience. 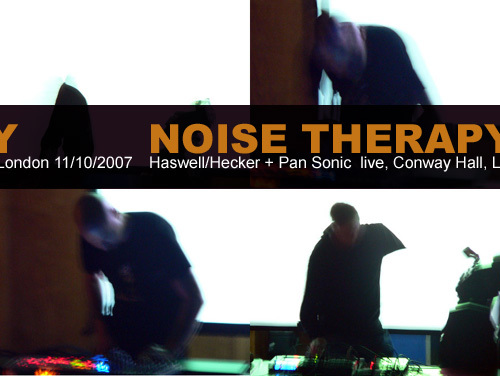 I’d waited a long time to see them live, but after Haswell/Hecker’s set (which a friend perceptively noted was sufficient for one evening’s entertainment), Pan Sonic’s sound proved to be a little disappointing: flatter and relatively two-dimensional, it issued from the speakers in one direction from the stage. The music also at times became a touch monotonous in its structure and lack of rhythmic detail. Having said that, there was a lot of pleasure to be gained from the Finnish duo’s tempestuous battering of the audience’s eardrums. I just wish I’d seen them on a separate night from Haswell/Hecker.